To aid designers and enthusiasts (and anyone who wants to win a trebuchet competition), I created a trebuchet simulator, programmed in Microsoft Excel which simulates the motion of a trebuchet, and is very useful for trebuchet design. It captures all the essential trebuchet physics. And if you wish to build a trebuchet yourself, this trebuchet software program allows you to optimize the dimensions of your trebuchet for maximum throwing distance, and also allows you to determine the required finger angle which results in the trebuchet releasing the payload at the right time, for maximum throwing distance. The required finger angle is based on the friction between the finger and ring. See the link above for an explanation of finger angle and ring. A user manual in PDF format is included with the Excel program. The simulator is straightforward to use and since it is programmed in Excel the design data is displayed automatically in charts, for easy reference. 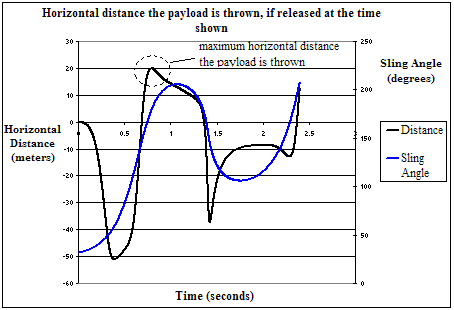 The figure below shows an example of a chart in the Excel spreadsheet, which shows range (throwing distance) as a function of release time. 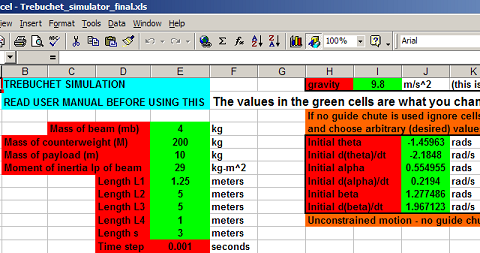 Below is a screen capture of the Excel spreadsheet. • Choose whether or not to use a guide chute. • Calculate sling tension, and the reaction forces at the fixed pivot location of the beam (to which the sling and counterweight is attached). Accurately predicting the motion of a trebuchet requires a lot of complicated mathematics. Having a software program, like this simulator, will save you a lot of work. All the files that come with this trebuchet simulator are contained in a single (compressed) file, in the "zip" format. This file is 2.4 MB in size. You need to uncompress this file before you can access it. To use the trebuchet simulator program you need to have Microsoft Excel installed on your computer. The program is compatible with all versions of Excel. The program plus manual is available for download here.